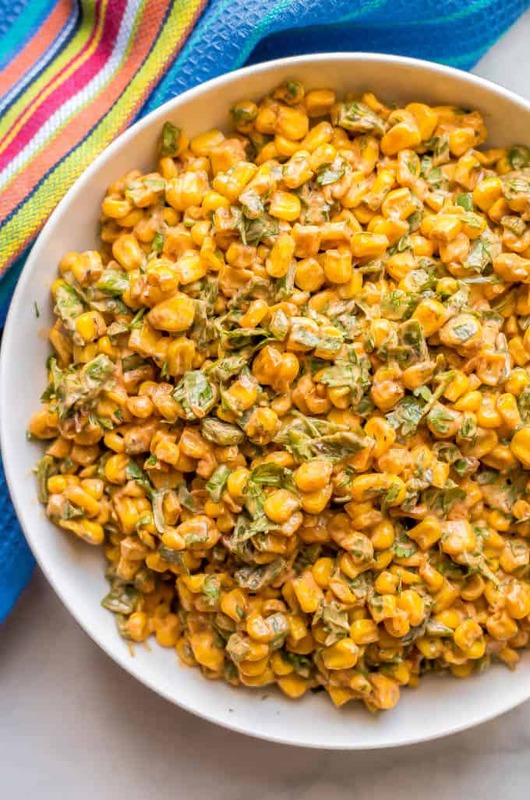 Summer corn salad with roasted poblanos, cilantro and a creamy dressing is a fresh and flavorful veggie side dish. 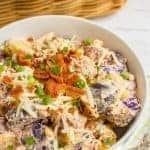 It’s great served in individual cups for a portable and fun BBQ recipe everyone will love! M had her 7th birthday party with her friends, followed by a birthday party for her best friend from preschool, and a spring neighborhood cul-de-sac party yesterday. We also had my parents over to celebrate M’s birthday last night with the two-layer vanilla cake she requested and helped me make. M adores corn and will happily chow down on as much of my easy foolproof corn-on-the-cob as I will give her. 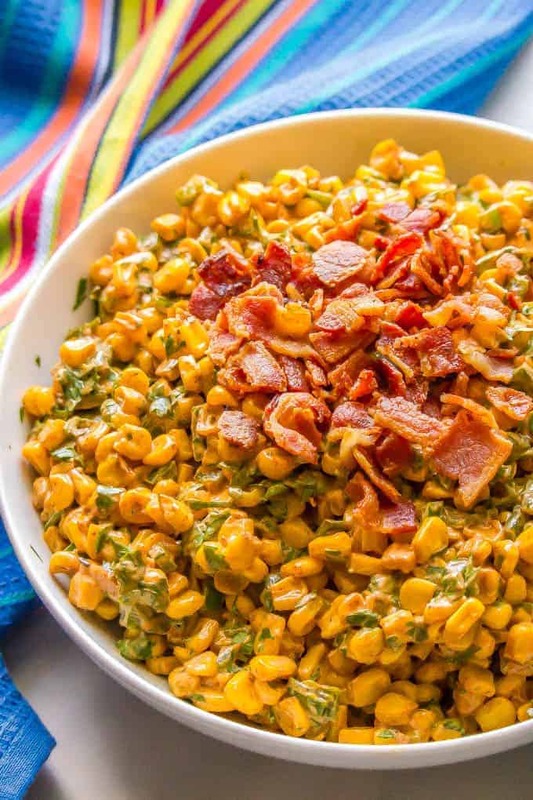 I also love to make my easy Southern summer succotash every year and we also enjoy spicy corn radish salad and even bacon rice with corn. Bring on the corn! 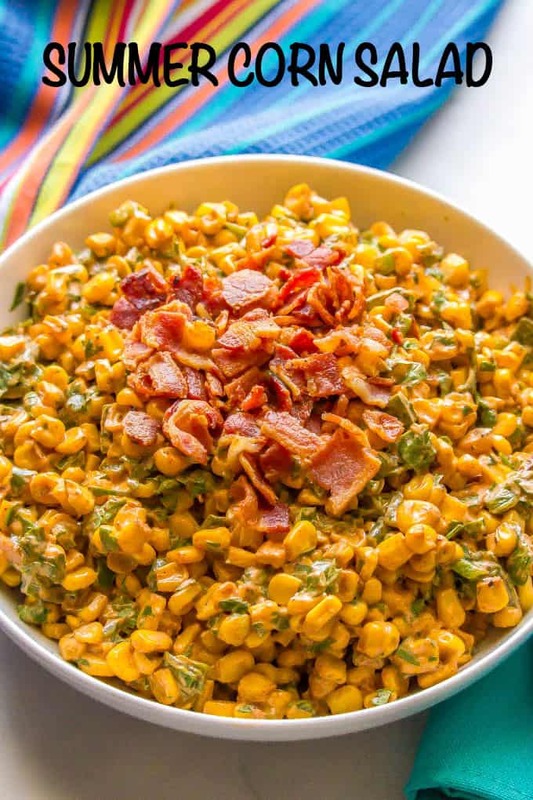 Today I’m sharing with you my creamy summer corn salad. 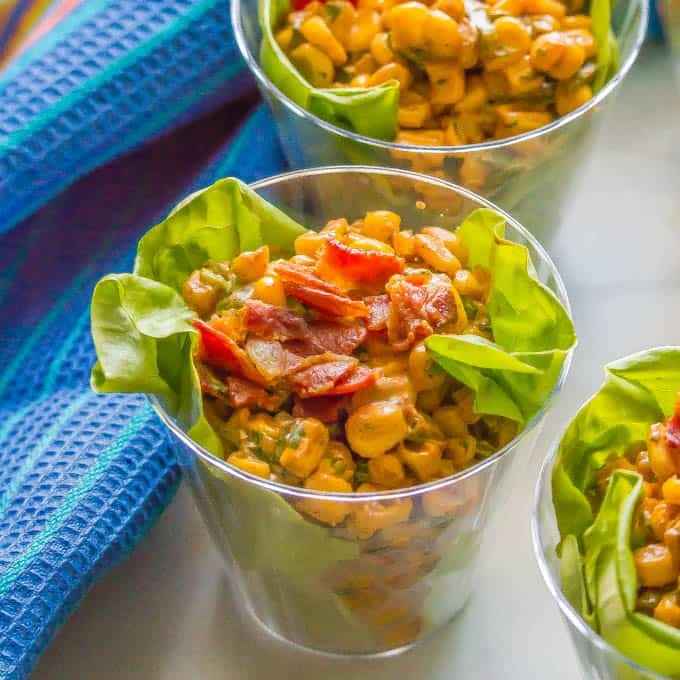 It’s loaded with sweet corn kernels, roasted poblano peppers, plenty of fresh cilantro and a creamy lime-spiked dressing to coat everything and tie it all together. 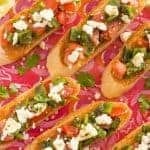 It’s a great recipe for picnics, BBQs and summer parties because it can feed a crowd and can also be served individually in cute little corn salad cups. It’s gluten-free and vegetarian, unless you add the bacon on top. Which you should definitely do – gives it a get salty, crunchy bite that’s oh so satisfying! This salad needs to be made ahead and chilled, so please plan accordingly. I included instructions in the notes about how to roast your poblano peppers. I’ve also made this recipe with charring the corn first. It gives it a little extra depth of flavor but it’s optional. I included notes in the recipe below if you’d like to add that step. 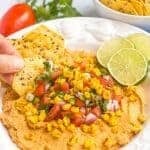 You can substitute frozen corn in this recipe if you prefer. Just make sure it’s thawed before you mix the salad. The jalapeño in the recipe is optional. I like adding a little spice, but I sometimes leave it out if I’m serving this at a party with kids. Feel free to add in some finely chopped red onion to this salad. I love serving this in individual glass cups for a portable and fun BBQ party side dish. 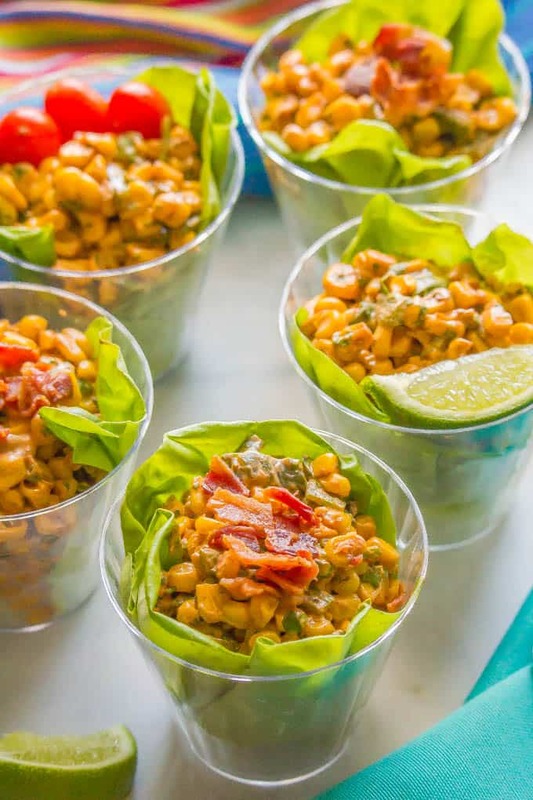 You can layer each cup with some lettuce leaves and a scoop of the creamy corn salad. 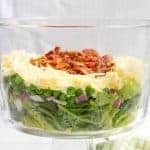 This salad is great served with some crumbled, cooked bacon on top. You can keep it on the side if you have vegetarians. 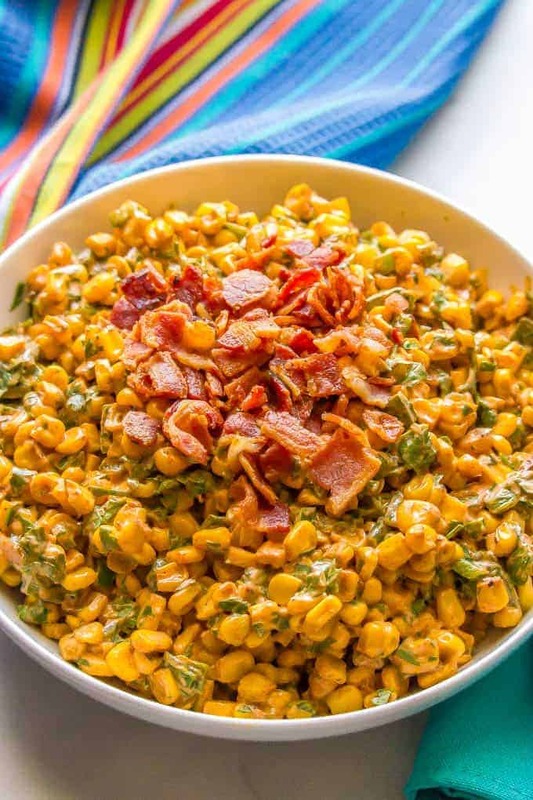 Whether for Memorial Day this weekend, a backyard BBQ party or a picnic in the park, I hope you give this summer corn salad a try. 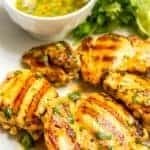 Looking for some more BBQ party favorites? 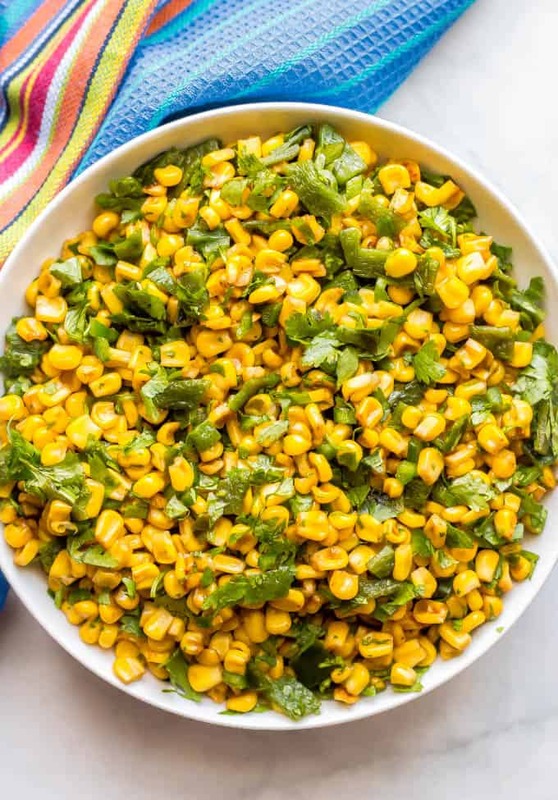 Summer corn salad with roasted poblanos, cilantro and a creamy dressing is a fresh and flavorful veggie side dish. Combine corn, roasted poblanos, jalapeño and cilantro in a large bowl. In a separate bowl, mix together the Greek yogurt, mayonnaise, lime juice, paprika, salt and pepper. Stir to combine. Pour the dressing over the salad and mix thoroughly. Chill for at least 1-2 hours, so the flavors have a chance to meld. Then season to taste with extra salt and pepper and serve. If you would like to char the corn for extra flavor, add the corn kernels to a dry skillet over medium low heat. Cook for several minutes, stirring occasionally, until the corn starts to color. You may need to work in batches so it chars and doesn’t steam. Let the corn cool then proceed with the recipe. To roast your poblano peppers: If you have a gas range, you can do it right over the burner, turning each pepper with tongs to get them charred on all sides. Or, use your oven and broil the peppers, turning them over every minute or so to char all sides. Once blackened, place the poblano peppers in a bowl and cover with plastic wrap (this lets them steam). After about 10 minutes and once they are cool enough to handle, peel back the charred skin from the poblanos and discard - you can use a paper towel and just rub it right off. Remove the stem and seeds from inside the peppers and discard. Chop the peppers. Feel free to add in some finely chopped red onion to this salad. 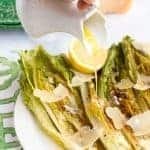 This salad is also great served with some crumbled, cooked bacon on top. I love all the bright flavors in this salad. What a perfect addition to our Memorial Day menu!